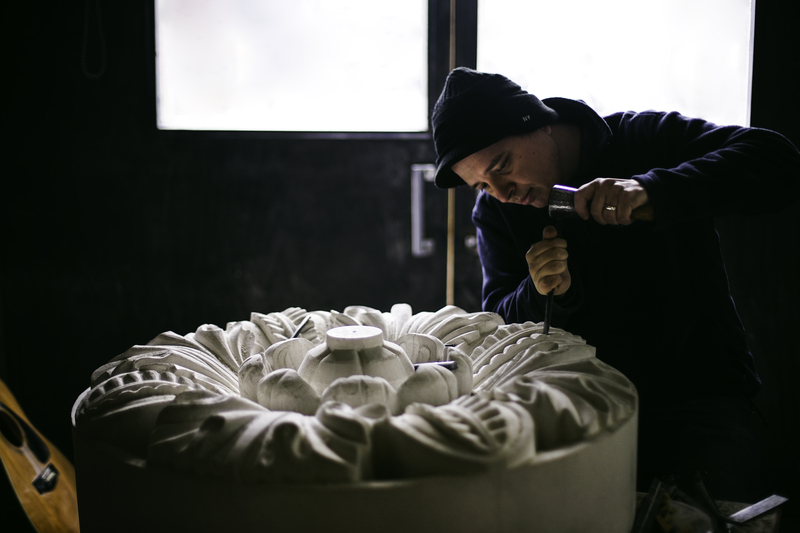 Award winning master stone carver, sculptor & artist, Tom is a founding member of the London Stone Carving Workshops, a member of the Master Carver’s Association & of the Worshipful Company of Masons. Tom’s career began in the time-honoured tradition of European stonemasons from the Renaissance onward, travelling Britain & Europe to gain experience on various high-profile stone commissions. This journey broadened his historical grasp of the tradition he had entered & taught him the practical skills needed to bend an intransigent medium to his will. Tom keeps the ancient craft of working stone alive, perpetuating our great European tradition of stone craft & built heritage, through his own original sculptural work & historic restoration carving. He has worked on many varied & exciting private/public sculptural commissions & prestigious carving restoration projects, from the V&A’s Renaissance galleries & London’s Royal Albert Memorial to St George’s Chapel Windsor, Horace Walpole’s Strawberry Hill Mansions & sir John Soane’s Pitzhanger Manor. Tom’s work concentrates on the sheer and permanent beauty of form in nature. He aims to express the power and vibrancy of the living world through the tactile mediums of clay, stone & bronze in all their beauty & timeless variety. He is proud to often be swimming against the present tide of the abstract & the conceptual in current art practice. Simon Watney Conservation Cases Recorder at The Church Monuments Society.